4Easysoft WMV Converter is the expert of converting video to WMV. It can convert all popular video formats to WMV video. You can convert MP4 to WMV, convert AVI to WMV, convert MPEG to WMV, convert HD videos to WMV, and convert other video to WMV video with high quality. To make the converted WMV video different, you are allowed to edit the video before converting to WMV. Trimming, cropping, merging, effect adjusting, watermarking are all available with 4Easysoft WMV Converter. Powerful editing features: trim, crop, merge, effect, watermark, etc. 4Easysoft WMV Converter can convert video MP4, VOB, DAT, M4V, TS, RM, RMVB, FLV, ASF, AVI, 3GP, FLV, SWF, MPV, MOD, TOD, QT, MOV, MTS, TS, MKV, TRP, etc. to WMV. This WMV Converter highly supports various HD videos. With this WMV Converter, you can convert all video files to audio MP3, ACC, AIFF, WAV, WMA, OGG, etc. Also it can convert between audio files. You can input multiple video files and convert them simultaneously to save the valuable time. 4Easysoft WMV Converter can help you adjust the video brightness, contrast, saturation to change the video visual effect. With 4Easysoft WMV Converter, you can split a certain part movie from the source video and merge several video files together to output a WMV file. Adjust the video aspect ratio and zoom mode to change the video play screen to fit your player. 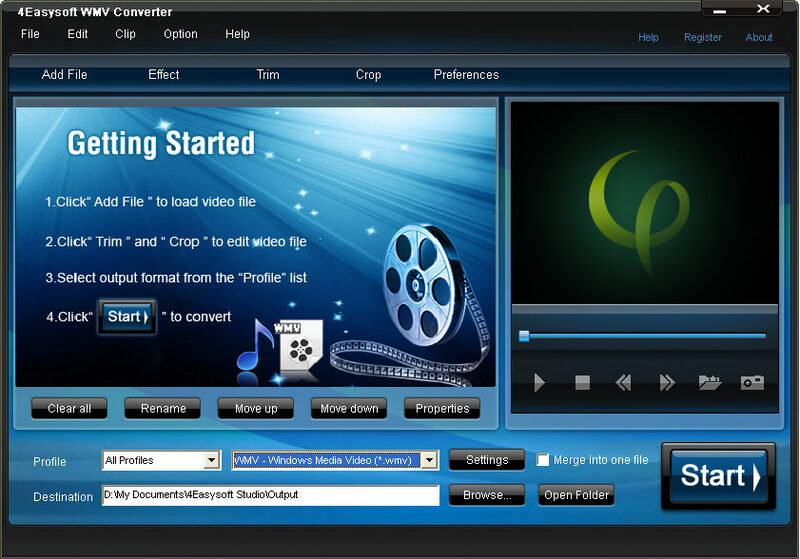 The WMV Converter enables you to add text or image watermark for the output WMV video. You can change the position and transparency of watermark for your need. Set Video Encoder, Resolution, Frame Rate, Video Bitrate, Audio Encoder, Sample Rate, Channels and Audio Bitrate in the settings windows to recreate the WMV video. Choose your preferred subtitle and audio track before output WMV video. 4Easysoft WMV Converter has the intuitive interface, which is convenient for the video to WMV conversion. With professional video encoding and decoding technique, 4Easysoft WMV Converter can bring you fast video converting speed and high output WMV quality. Insert image or add text title if needed. How to Convert any Video(including Mod files) to WMV?